As the Facebook generation grows up, the social networking website is allowing users to announce even more pivotal moments to their network. 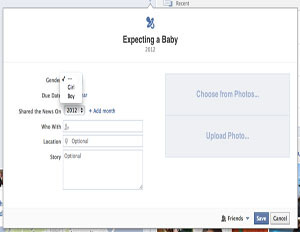 Facebook unveiled a new “Life Eventâ€ for Timeline on Monday that allows Facebookers to share they are expecting a baby. In addition to sharing the good news, future parents can list the due date, gender, location, who the other parent is and a lengthy story. An image can also be attached to the announcement. This feature replaces the “Expected: Childâ€ option.